Don’t Lose Out on the Compensation You Deserve. Schedule Your FREE Consultation Today! Have you or someone you know or love been injured by another’s negligence? Are you afraid of not being able to afford a good personal injury lawyer who will fight for you? The Fighting For People Injury Law Group of The Pollack Firm does not get compensated if we do not win your case, so you don’t have to worry. What are you waiting for? Schedule your free consultation by contacting us or call us at (800) 549-4LAW (4529) or (215)396-9660. At The Fighting For People Injury Law Group of The Pollack Firm, we don’t get paid any fees unless there is a recovery on your case! When you become a client of our firm, our contingency fee agreement states very clearly that we only are entitled to fees if there is a recovery. If there is no recovery, there are no fees. No questions asked! We do this, because you matter! No one ever expects to be in an auto accident. Unfortunately, sometimes the unexpected happens, and you may find yourself the victim of someone else’s careless driving. If you are in an accident, being prepared to ask the right questions and collect the most important information can make your accident claim successful. Documenting the right information after an accident is vital to protecting the rights of you and your family, as well as your property. 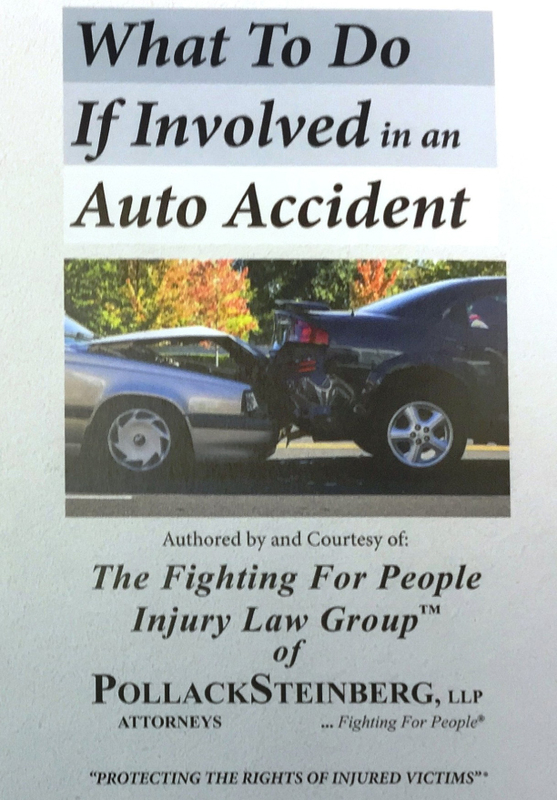 Click here to obtain your FREE COPY of “What To Do If Involved In An Auto Accident”, which we urge you to keep in the glove box of each car that you and your family members own. If you should unfortunately be involved in an automobile accident, please be sure to review the brochure, while at the scene, and document all information within the brochure to help keep you protected and to ensure that you have the information necessary to properly report your claim. We also provide FREE INSURANCE POLICY REVIEWS to help you both understand your auto and home owner’s policies and determine if you are protecting yourself and your family. Click here to find out how to obtain your FREE INSURANCE POLICY REVIEW.